The Board of Friends of Ecological Reserves has been included as one of the 400 intervenors accepted out of the 2,118 who had applied, to present to the National Energy Board at the hearings of Kinder Morgan’s proposed pipeline expansion project. Our application was submitted in early February. The Kinder Morgan pipeline expansion project proposes to twin their Trans Mountain pipeline along their existing right-of-way between Strathcona County, Alberta to Burnaby, British Columbia where possible. They will add new pump stations along the route and increase the number of storage tanks at existing facilities. The Westridge Marine terminal in Burnaby will also be expanded. This proposed expansion will result in an increased capacity from 300,000 to 890,000 barrels per day. Much of this new capacity will be diluted bitumen from the Alberta oil sands. The Aframax tankers proposed to serve the Kinder Morgan pipeline are approximately 245m long. Tanker traffic will increase through the Salish Sea from the current five tankers per month to approximately 34. The 2013 government-commissioned risk analysis report on tanker traffic safety in Canada concluded that the area off Southern Vancouver Island is a “very high risk zone”. Within this area lie 17 of the province’s 33 marine Ecological Reserves. Friends of Ecological Reserves is very concerned for the ecological integrity of the marine reserves within this zone. Our provincial Ecological Reserves rely on science-based research and are designed to serve as baselines for environmental health on our coast. 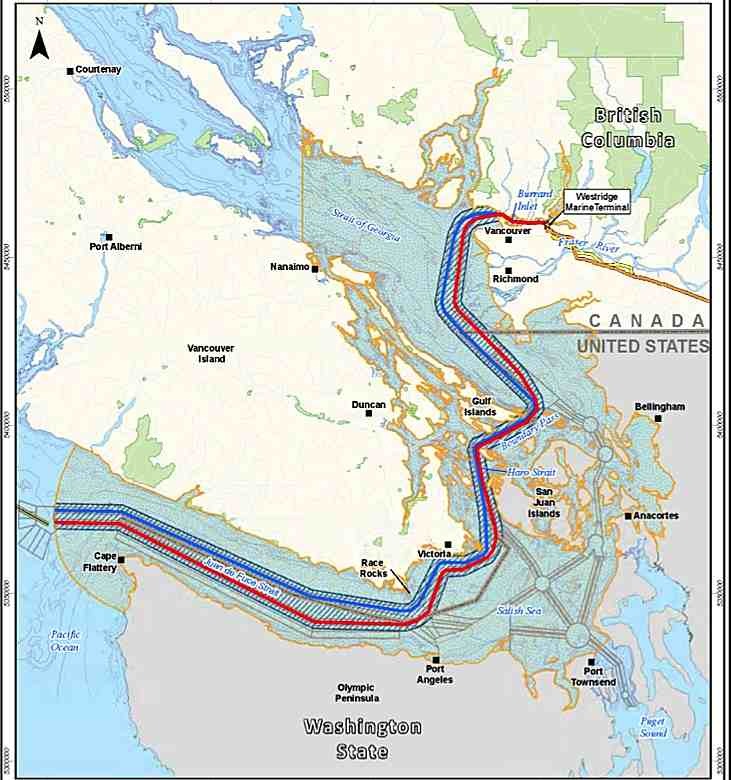 With the increase in tanker traffic that would result from the Trans Mountain pipeline expansion, these reserves, already at risk, are particularly vulnerable to irreversible ecosystem damage and extirpation of rare species from the effects of ship accidents, collisions, groundings or accidents at terminals resulting in the release of toxic substances into the Salish Sea. Most of these marine ERs are islands that are home to colonies of nesting or overwintering sea birds, marine mammals and sub-tidal fish and invertebrates. Mitigation of accidents in these ecosystems is essentially impossible. 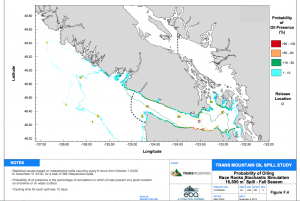 Four marine Ecological Reserves at the southern tip of Vancouver Island in particular, would be directly exposed to contamination in the event of a marine accident of any vessel in the Strait of Juan de Fuca. The most northerly and only birthing colony of elephant seals in Canada is on the Race Rocks Ecological Reserve. Race Rocks is also a winter haulout site for two species of sea lions, and a birthing colony of harbour seals. It is also prime Orca habitat. Three seabird species have nesting colonies on the island and the subtidal marine life in this Rockfish Conservation zone has extremely high biodiversity values. The risk for these rare colonies from increased tanker traffic is very high. Containment of an oil spill in adverse weather conditions with tidal currents running up to 7 knots, make mitigation of a catastrophic event in this reserve impossible. Moreover, the population of marine birds and mammals is highest in the winter months when the sea conditions are at their worst. These are just a sample of the graphs and charts provided for each site and for each season. They are based on wind conditions present at the time of the simulation. These models show the vulnerability of our marine Ecological Reserves. 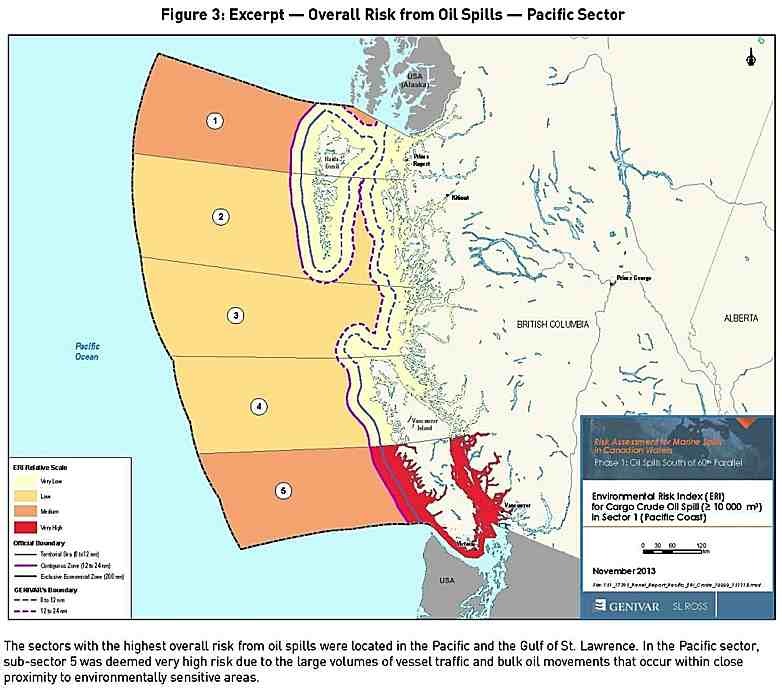 Members of the Friends of Ecological Reserves who have concerns about the effects of chronic and catastrophic oil spills on the marine Ecological Reserves on Southern Vancouver Island are encourage to contact us with their concerns at: ecorserves@bc.ca or garryf (use the @ sign) gmail.com.